Great pres, ﬂexible I/O aplenty and intuitive software control. All in all, very impressive. MixControl software highly ﬂexible. Great-sounding preamps. Light and highly portable. 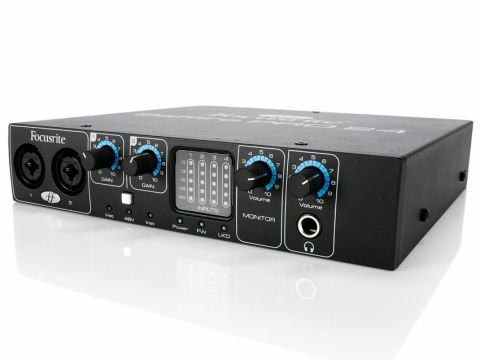 The preamps represent the Saffire PRO 24's standout feature. Focusrite's newest addition to the well-established Saffire audio interface range is the PRO 24, which arrives in half-rack form. Despite its modest size, a quick glance at the front and back panels reveals there's plenty to admire, so let's dive in. Round the back, you'll find most of the Saffire's I/O options. These include two line inputs and six outputs (meaning that, like the original Saffire, this unit will support surround applications), as well as the all-important FireWire connection, MIDI In/Out and a 12V DC input (though the interface is also buss-powered via its FireWire connector). Digital connectivity is supplied by S/PDIF In/Out ports, and there's an optical port which provides an additional eight inputs. At the front you'll find the PRO 24's twin combi XLR/line inputs, plus a switch to enable 48V of phantom power (the single switch enables this for both channels). Otherwise, the front panel concerns itself with Gain knobs, the main output Monitor dial and a separate headphone output control, with assorted LEDs providing status updates for levels, phantom power presence and the like. Impressively, the Saffire can handle 16 inputs and eight outputs, which provides immense flexibility for a unit of this size. Installing the Saffire is painless. Once you've popped in the bundled CD, you'll find there are two separate install processes, one for Saffire's 'software brain' MixControl software and the other for Focusrite's plug-in suite. If you're online during install, the installer even checks to see if a newer version of the software is available, which is a neat touch. The Focusrite Suite installs four plug-ins (Compressor, EQ, Gate and Reverb), which can be activated via a serial number for up to four separate computers. You'll also find a second bundled disc entitled Xcite+ Pack that contains some tasty extras, including Live Lite 7, a copy of the BassStation plug-in and some great samples. Once restarted, the Saffire is a snip to use. It is most easily configured within the MixControl GUI, which keeps you updated with levels across all I/Os as well as allowing you to set up different mixes and monitor configurations that you can then toggle between on the fly. The standout feature for us, however - particularly at this price - is the quality of the preamps, which sound excellent. Focusrite has a proud tradition in this area, so perhaps this should have come as no surprise, but it's fair to say the sound these pres produce blows much of the competition out of the water. TheSaffire range's reputation will be enhanced by this latest addition, which offers a lot for the price but will comfortably fit in a laptop bag. Its zero-latency monitoring and high-quality D/A conversion provide pro options, but this interface is well within shooting range for even start-up studios.